BOOKLIST (STARRED) -- A stirring call to action that's particularly timely in this election year, and one that will resonate and empower young readers in particular. Essential reading. Top Shelf is honored to present a milestone of comics history: the stunning conclusion to the award-winning and best-selling MARCH trilogy. A #1 New York Times Bestseller National Book Award Finalist. KIRKUS (STARRED) -- A living icon of the civil rights movement brings his frank and stirring account of the movement's most tumultuous years (so far) to a climax. As chairman of the Student Non-Violent Coordinating Committee between 1963 and 1966, Lewis was directly involved in both public demonstrations and behind-the-scenes meetings with government officials and African-American leaders. He recalls both with unflinching honesty in this trilogy closer carrying his account from the bombing of the 16th Street Baptist Church to his eventual break with SNCC's increasingly radical elements. Alternating stomach-turning incidents of violence (mostly police violence)-including his own vicious clubbing on the Selma to Montgomery march's "Bloody Sunday"-with passages of impassioned rhetoric from many voices, he chronicles the growing fissures within the movement. Still, despite the wrenching realization that "we were in the middle of a war," he steadfastly holds to nonviolent principles. The passage of the 1965 Voting Rights Act marks the end of his account, though he closes with a final look ahead to the night of Barack Obama's 2009 inauguration. Powell's high-contrast black-and-white images underscore the narrative's emotional intensity with a parade of hate-filled white faces and fearful but resolute black ones, facing off across a division that may not be as wide as it was then but is still as deep. 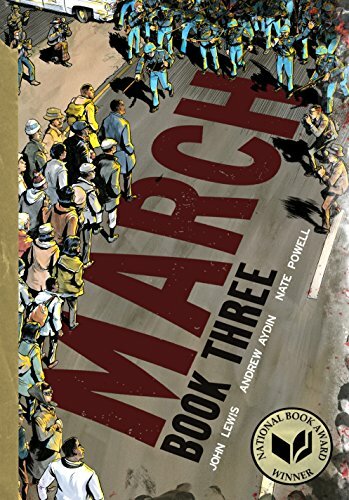 SHELF-AWARENESS -- The March series--Congressman John Lewis, Capitol Hill staffer Andrew Aydin and illustrator Nate Powell's Eisner Award-winning project documenting the Civil Rights Movement of the 1960s in comic book format--concludes with a message that has proven to be just as relevant in 2016 as it was 50 years ago. The third volume continues where the second left off. Less than a month after Student Nonviolent Coordinating Committee (SNCC) leader John Lewis led the March on Washington for Jobs and Freedom, four teenage girls are killed in a bombing at the 16th Street Baptist Church's Youth Day celebration in Birmingham, Ala. Members of Dr. King's Southern Christian Leadership Conference (SCLC) and the SNCC are outraged and threaten to march on the Alabama capital to demand the resignation of Governor George Wallace. Before either group can take action, however, news comes of President Kennedy's assassination. While Lyndon B. Johnson ultimately champions their cause, he does so without changing the status quo. As the SNCC and SCLC continue their protests, their efforts incite further violent backlash from the police and surrounding communities, and fractious struggles within the SNCC threaten to derail the march from Selma to Montgomery. Discover: John Lewis and Martin Luther King make "good trouble... necessary trouble" by leading the history-changing march from Selma to Montgomery. Nate Powell is the author and illustrator of the graphic novel "Swallow Me Whole "(an "LA Times "Book Prize finalist, the 2009 Eisner Award winner for Best Graphic Novel, and an Ignatz Award winner). He is currently working on an illustrated novel for Roaring Brook Press, with author Cecil Castellucci. Nate lives in Bloomington, Indiana, with his wife.